I’m not sure how it started. Actually, that’s a lie. I know exactly how it started. November 8th, while perusing an open house at a local plastic surgeon’s office, I elected to have a B12 injection. Not believing that I’d be affected by such a thing, I was more than surprised when, two mornings later, I sprung awake at 4am, bright-eyed, ready for the day. While the 4am wake up time didn’t stick- happily, I went back to my 6-ish alarm a few days later- the productive mornings have, and they’ve started to rub off on someone else in this house. When a seasonal cold gripped it’s hands onto Bryan a few weeks ago, he began waking up early to blow his nose, take DayQuil, and hydrate. It was during one of these snot-filled mornings that he made his way downstairs while I was scooping out some Greek yogurt and asked if there was coffee. I put on a huge pot to brew, made a second bowl of yogurt- with raspberries, blueberries, and a little honey- and the two of us enjoyed a quiet 7 o’clock hour in the still-dark kitchen. This is something that hasn’t happened before. I’m envious… Bryan can be much like a puppy. He never seems to get enough sleep, and can allow himself to sleep until close to noon on the weekends. Weekday mornings always started with him sprinting out of bed a half hour before he was supposed to be opening his doors for the day’s business, so there was never time for him to wait the 4 minutes for the French press to steep, much less make a full-fledged meal. Now? He’s awake when I’m finishing getting ready for the day, padding downstairs with me for kombucha, for coffee, and for the day’s yogurt, egg whites, oatmeal…. It’s as if we’ve added 5 more days to our weekend mornings, sitting quietly together before we start the day. 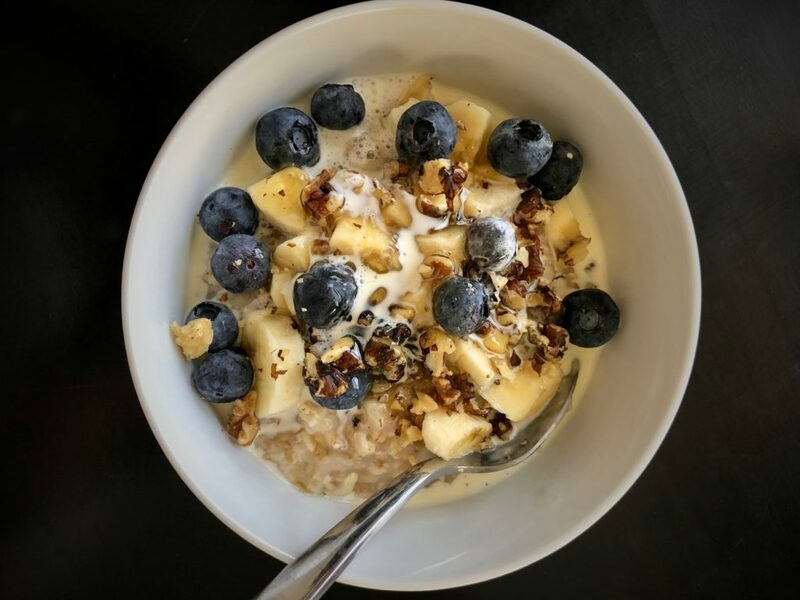 It’s peaceful, it allows us both to clear our minds, instead of one of us feeling rushed, and- possibly most importantly- it has inspired some beautiful morning oatmeal creations. My favorite? Blueberries, banana, walnuts, honey, and a splash of fresh cream.